Did I ever tell you about my Dreamy Creamy? No? Well, here's the short version. Dreamy Creamy was my engagement present to myself. I saw the pattern (WARNING: Links to a Word document.) 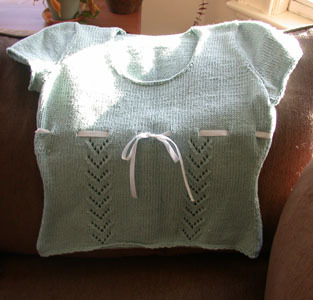 on J-Strizzy's blog and loved the idea of a sweet, empire-waist top made of Calmer. She had designed the shirt for herself, so I knew I'd have to make a some adjustments. 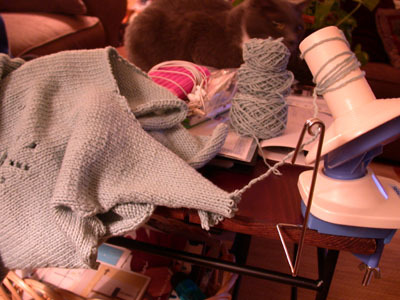 It took a while, but by the time I finished it I was satisfied that I had adapted the pattern for myself. Cute, right? Well, sure, when it's laying there all pretty on my couch. I actually wore it a few times, but I had missed one important adjustment: it was a bit short in the upper torso. This meant it rode up every time I so much as lifted an arm, and that pretty ribbon band landed right in the middle of my... well, you get the idea. Next thing I knew, all that pretty Calmer was just hanging in the "eh" section of my closet. And that just won't do. Here's where you come in. Does anybody have any experience with recycling Calmer? How does it do? Any tips? 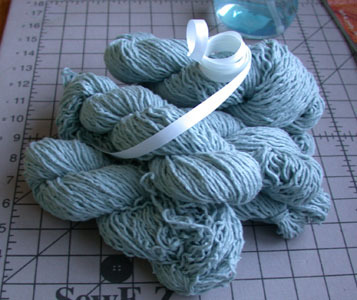 And most importantly, what should I make with this yarn?